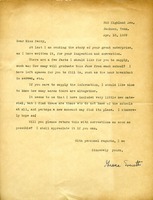 Grace writes to Martha asking about information about the Berry schools for Martha to fill in for the story that Grace has been writing. Martha Berry sends Mrs. Wever some literature on information she had asked for previously. It seems like Mrs. Wever is going to write an article on the Berry Schools. Martha Berry also explains when and why she started the Berry Schools in this letter.